HT-F03B Improved version Infrared Forehead Temperature Sensor is a thermo scope based on the infrared theory, and its main use is to exam the temperature of human body. The exact temperature can be acquired simply and swiftly by attaching it to people's forehead with its detector hole. All subjects that have temperature will proportionally emit infrared radiant energy according to the degree of its temperature. The intensity of the radiant energy and the cover of its wavelength has a direct relation with the subject's surface temperature. According to this principle, The surface temperature of people's forehead will be obtained, moreover, by modifying the temperature difference between the surface and the whole body, the exact date will be insured. 1: It's specialized in measuring the temperature of people's forehead. In addition, the shortcoming in examing the temperature will be avoided by the temperature compensation procedure. 2: The use of HEIMANN infrared detector hole is exclusively adopted by our company, thus we insure you a stable and accurate measure. 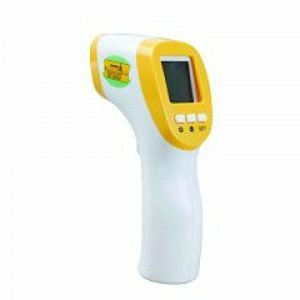 3: It provides sound indication when the temperature is much too high. 4: 20 times database can be recorded in the memory. 6: Both Fahrenheit and Celsius measure means can be used. 7: The body is compact, the construction is ideal, and the instruction is convenient. 1: Work Temperature: 10-40 cent degree. (10): Automatic Power off: 5 seconds. In addition: This device are best for our baby, children, pregnant women, and older people.